The Nidderdale One-Act Drama Festival takes place at the Frazer Theatre, Knaresborough. The event takes place from Thursday March 14 to Saturday March 16. The repertoire features plays by local authors Bernie Crosthwaite and Keith Burton. Then the winners will go forward to contest the Northern Final at Washington Arts Centre, Tyne and Wear, over the weekend of May 4 to 5. 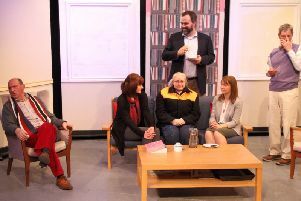 The British Final of One-Act plays provides a special incentive for the winning Nidderdale festival group since this culminating event of the festival season will be held locally at Harrogate Theatre on July 5 and 6.